The capital of Majorca can easily compete with other European metropolisis. The city´s landmark is the Cathedral La Seu. The impressive building with its gothic towers is the most famous church in Spain. At the marina of Palma de Majorca it is easy to recognize that people from all over the world visit this popular Balearic Island. Imposing yachts and sail boats arrive from all different countries. The modern municipal park of Palma is called Parc de Mar. It is located directly below the Cathedral, next to the harbour. The Plaza Mayor downtown is very impressive. It provides the perfect spot to take a little break from a city tour, where one can watch the drive of vacationers and locals while sitting in one of the numerous cafés or tapabars. The various little alleys invite for a shopping tour in the old town. The most important shopping miles are the Passeig d´es Born and the Passeig de la Rambla. The centrally located market is situated in the halls close to the Plaza d´Espanya. The quality of the famous Spanish ham, Jamon Iberico, is well known around the world. Fish enthousiasts have to visit the Mercat de L´Olivat, where one will find a broad range of fresh fish and seafood. This town in the north of the island attracts many vacationers with its beautiful beaches that are especially suitable for family holidays with children. Pollenca is situated in the northern Sierra de Tramuntana and is famous for Mount Calvary, that offers a breathtaking view over the ocean and Cap de Formentor. The town´s landmark is the the fountain Font del Gall at the Plaza del Font des Gall. It is located in a bay south of Pollenca. Life is comfortable in the magnificent villas of Bonaire at the mountain side of Sa Victória. The beaches Ma Pas and Sa Marina at the Badia de Pollenca are very suitable for families. The bay of Alcudia with numerous beaches where children build sand castles, extends to the Cap de Ferrutx. In the old town of Alcudia life seems to stand still during the week. This authentic Majorcean village is situated in the east of Majorca. There is a great infrastructure for sailors, because the harbor is shielded. The famous night club Nautico is inviting for a drink. The two stalactite caves Cuevas del Drach and Cuea´ vas dels Harm are also worth visiting. 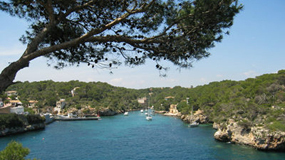 Also located at the east coast, the „Old Majorca” can be explored in Porto Colom. Fishing boats are dancing on the water in front of the small colorfull houses along the old harbor. An excellent marina creates a great infrastructure for sailors. The Colon, one of Majorca´s best restaurants, can be found at the promenade. The scenic old town offers the perfect spot for a walk, far away from mass tourism. This town in the southeast of Majorca is very introspective. The residents live on trade and argiculture, there is very little industry. The region is known for its sand stone, that is usually used for the construction of houses and churches. 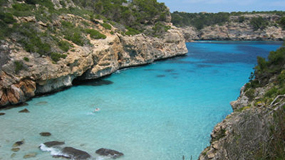 Famous and popular beaches are Cala Santanyi, Cala Llombards and Cala Figuera. The quiet town in the southeast of the island is very pictorial. The cloister San Salvador, which is located on the correspondent mountain close to Felanitx, is a famous place of excursions. This inconspicuous town, which is also situated in the southeast, has lots of interesting things to offer. The noble town hall is a popular photo motif and the area provides many hiking trails. One of the most beautiful trails on the island leads from Cap de Ses Salines along gorgeous beaches like Es Caragol to Colonia de Sant Jordi. This towns in the southwest of the island offer lots of privacy. Stunning villas close to golf courses or beautiful beaches like Calla Peguera turn these towns into interesting destinations. 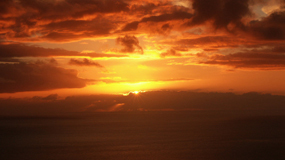 The vicinity to Palma de Majorca is also very attractive for vacationers. Many Germans have settled here. Magnificent villas and luxurious fincas border the steep coast around the Cap de sa Mola and the Cala Llamp. The noble golf course Camp de Mar is just a few kilometers away. Port Andratx´ harbor with its lively water front is very inviting for a walk, to see and to be seen any time of the day. The hotel Villa Italia at the promenade offers a great view over the marina and the Mola with all the exclusive villas. The promenade is seamed by countless restaurants and tapabars. The Rocamar is one of the most famous meeting points. At the rocky west coast of Majorca, the little towns nestle up against the mountainside of the Tramuntana. Banyalbufar is a picturesque mountain village with noble properties. 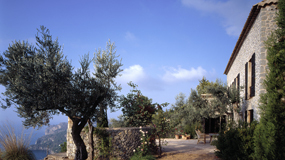 Many of them are used agriculturally, where they grow olives and citrus fruits. Other properties were converted into beautiful rental villas. Besides Soller, this is the most famous town in western Majorca. It is popular for its cloister and the charterhouse of Valldemossa. In 1838 Frederik Chopin and his partner George Sand spent the winter in Valldemossa. The town used to be the meeting point for the intellectual and artists in the 60s and 70s of the last century. Even today, various art galleries and studios testify to this exciting time. Two of the most famous restaurants of the island, Sebastian and El Olivo, can be found in Deya. Cala Deya is one of the few bathing coves on the west coast of Majorca. This charming city with its protected harbor used to be accessible by only one country way over the mountain pass Coll de Soller until a few years ago. 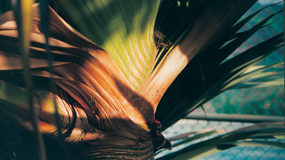 Soller is situated in a fertile valley, that extends to the ocean. Besides tourism, the economical basis of the residents is the cultivation of citrus fruits, vegetables, other fruit and olives. After the toll tunnel was built tourism found its way into Soller. Plaza Constitucio with its glorious curch Sant Bartomeu is located in the center, where the drive of the city happens from morning to night. The only railroad line of the island leads from Palma to Soller. The tram between Soller and Port de Soller, the scenic seaport with its beautiful promenade and beaches, is lovingly called „Orange Express” by the Majorcans.